You don’t need a PhD in statistics to wield the power of workforce analytics, but you will need to roll your sleeves up and do some important work. There are key principles you must follow to ensure your analytics efforts translate into a concrete plan that will move the needle on both engagement and bottom-line results. This webinar caters to those particular needs. Understand the significant benefits of using the world’s most widely used CX metric - NPS and learn predictive CX analytics. Webinar | How To Engage The Organization Effectively? How To Engage The Organization Effectively? This webinar helps you understand one of the most challenging aspects of a successful NPS and CX program – engaging the organization. This webinar helps you understand the significant benefits from using the world’s most widely used CX metric - Net Promoter Score. Learn how to keep a pulse of the market and identify opportunities using Communities with Gannett’s case study as the example. 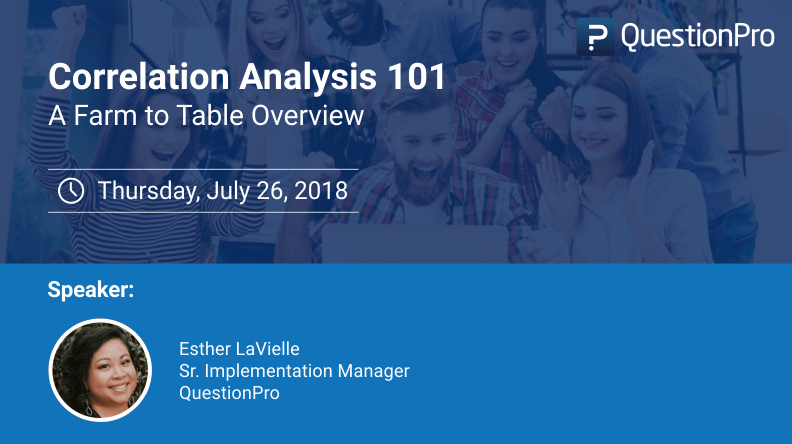 This farm to table overview of the popular market research methodology - Correlation Analysis will walk you through the practical application in analyzing your survey results with live customer examples. 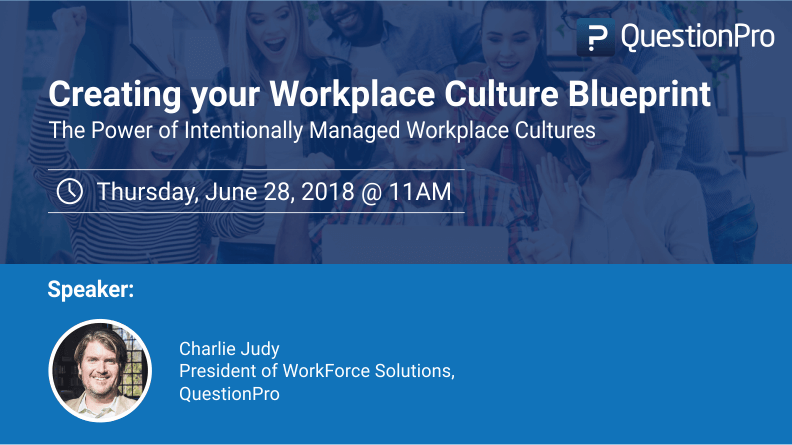 In this edifying webinar, learn about workplace culture and how creating a blueprint can help organizations gain meaningful insights when they embark on major culture remodeling efforts. This webinar will provide organizations and individuals with the right tools to create the blueprint and stick to it. In this informative webinar, learn the many ways that people are leveraging mobile approaches to make their online communities generate even higher ROI and how QuestionPro Communities' mobile tools and features will help accelerate your Mobile First initiatives. Webinar | GDPR - How is it going to impact you? GDPR - How is it going to impact you? In this informative webinar about GDPR, our in-house industry experts covered details about what the GDPR regulation is and what is QuestionPro's solution for GDPR compliance. This webinar also explained about the various components of GDPR and how is it going to be essential for organizations to be GDPR compliant. In this insightful webinar, our market research experts explore the evolution and history of market research trends and help in identifying the real 2018 trends for market research. In this insightful webinar, Craig Lee, independent Customer Experience transformist, speaker, advisor and coach shared with the audience the key strategies of customer experience management. In the final part of the three-part webinar series we discussed workplace culture benchmarking and how to move the needles of culture. In the second, of our three-part webinar series, we concentrated on culture management and metrics using the workplace genome and its 8 key attributes and how to align culture to drive organizational success. CX professionals list organization engagement as a top challenge in realizing business results from their programs. In this webinar we discussed about how organizations need to be customer-centric not on by using the Net Promoter Score but also by implementing the CX program, that engages their entire organization. Webinar | WF - Culture 2.0 | WTF is Culture and Why does it Matter? Culture 2.0 | WTF is Culture and Why does it Matter? In the first, of our three-part webinar series, we focused on why organizational culture analytics is important, aligning workplace culture with employee success and how to map culture using 8 key attributes like innovation, transparency technology and growth. The last of our three-part webinar series on creating a successful CX program. We go over "benchmarking", the process of evaluating your product in relations to other companies. We focused on our latest research and analytical insights from our engagement and assessment data sets on what works in making our workplaces more positive and more productive. Break through the traditional method of measuring customer satisfaction. In this month's webinar, you'll learn how to gather customer expectations and use this information to create more effective surveys. In this webinar, you will learn how to choose the best approach to conducting qualitative research based on your business needs. This three-part webinar series will cover practical approaches to creating a winning customer experience action plan. Join us for Part Two, where we'll define best practices and explore the benefits and of customer journey mapping. This three-part webinar series will cover practical approaches to creating a winning customer experience action plan. In Part One, find out where to start with key CX metrics and best practices. In this webinar, we've brought together Information Security experts to discuss the evolution of Vendor Risk Management and its most common challenges for organizations while learning our top industry best practices. Learn how to measure Net Promoter Score (NPS) to deliver a better customer experience. In this webinar, Shep Hyken discusses NPS and how you can use that to measure your customer experience and drive revenue. Understand how to improve your data collection practices through better survey design methodology, tips to avoid response bias, variations in question styles, and optimal data analysis. In this webinar, get the best tips on how to make sense of quantitative data, from looking at the answers and survey goals, to crunching the numbers and drawing conclusions. Why Online Communities Are Taking Over the Insights World? Stay competitive with one of the newest research methodologies—Online Communities. Learn in this webinar factors that contribute to this method's success and the future of Online Communities. In today's day and age, millenials are taking over the workforce. Find out how to build, keep, and maximize engagement from millenials in the workplace. The better the survey design, the better the data your survey will yield. In this webinar, learn how to gain deeper insights by using two simple brainstorming tactics. In this webinar learn how to design a survey that does what you want, how to turn survey goals into real survey questions and how to turn resources into insightful data. How to get people to join an online community, how to increase levels of engagement and participation and how to sustaining it over time. Learn in this webinar. Learn how to set research objectives, understand your audience, create the right survey questions, how to distribute and analyze your surveys, and how to make informed decisions derived from your surveys. Experts deep-dive into mobile as the marketing measurement and data collection platform and provide a holistic view of current and future opportunities for marketers. This webinar reviews, how Choice-Based Conjoint Analysis, one of the most powerful analytics tool works and what business questions it can answer. In this webinar, learn how MaxDiff Scaling works, how to get accurate consumer insights, why it is superior to rating scales and what business questions it can answer. This webinar dives into four areas of online community management - Recruitment, Engagement, Data Collection and Rewards. Learn the tips and tricks to create your buzzing community. Find out how to use data to create an authentic employer brand and design the culture you want, rather than default to the culture you have. Learn how to develop products based on ever-changing customer demand. This webinar goes over product development lifecycle and shows how to get customers coming back for more. In this webinar learn how to take proactive steps to follow up with dissatisfied customers and transform your detractors into promoters. If you love the new hire of yours, chances are, your competitor wants him too. Learn how to acquire and retain your top talent. In this webinar, our experts share how to adopt a customer-centric culture and involve customers in your product development process to build amazing products. Learn how to engage community members, how to collect relevant insights from the holiday campaigns and utilize the insights to keep engagement after the holiday season. Learn how to engage enthusiastic customers in order to turn them into a powerful marketing force and capture the value that stems from customer satisfaction. Find out why customer engagement is so important, how it can improve your customer experience and how QuestionPro Communities, can provide the right environment and tools for such engaging activities. Find out which parts of your culture bring you value and what parts of your work culture are hindering your company's performance.